← June 7 – 12 days to go. Lookout! It’s a mountain. I was wondering if my legs were ready for big mountain passes, so I decided to test them out on Trail Ridge Road. Trail Ridge connects Estes Park to Grand Lake — about 50 miles (80 km) — by cutting through Rocky Mountain National Park. 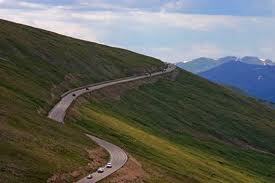 The road tops out at 12,183 feet (3,713 meters) and passes through some of the most spectacular scenery in America. (When Katherine Lee Bates wrote America the Beautiful, she was looking at Colorado). This morning, Suellen and I, along with our friends Unn and Stig from Sweden, drove from Denver to Grand Lake. While Suellen, Unn and Stig toured the town and lunched at the dreamy Grand Lake Lodge, I hopped on my bike and started pedaling from downtown Grand Lake (altitude: 8,366 feet or 2550 meters) to the summit, about 23 miles (37 kilometers) away. The first 13 miles rise gradually and the road is beautifully maintained. I cruised along at about 15 miles per hour (24 kph). Then I entered a series of switchbacks and had to tackle 6, 7 and 8% grades for the next ten miles. I settled into a good rhythm of 7 or 8 miles per hour — a little faster than the other day on Lookout Mountain. I felt stronger than expected and wound up pedaling the entire distance without stopping. Though I felt good, I may not have looked so good — a vulture followed me for about three miles. I guess I looked like a good lunch time snack. If you’re going to Trail Ridge, be sure to check on the conditions first. 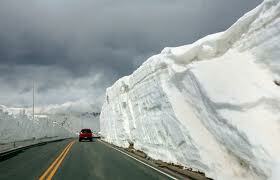 The road is closed for the winter as the mountains may get as much as 35 feet (11 meters) of snow. The Park Rangers try to open it by the end of May but this year they couldn’t clear all the snow away until June 6. 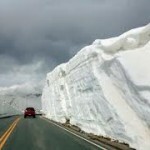 Even then, you’ll ride along a high wall of snow that may be 15 feet (5 meters) high. It’s a beautiful ride and a great place to throw a snow ball in June. One Response to June 10 – 9 days to go. Trail Ridge Tune-Up.